I used China Glaze Emerald Sparkle as a base (gorgeeeoussss! 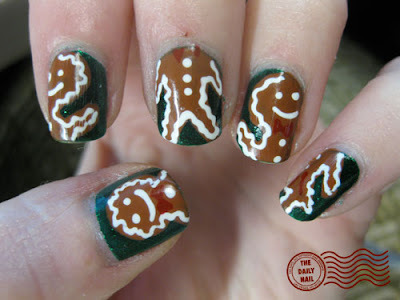 ), with OPI Ginger Bells for the ginger bread men, and Migi Nail Art Pens for the white. :) Of course, topped off with 2 coats of Seche Vite top coat too! Hi, I just wanted to ask what kind of tool or brush you use to paint on the gingerbread man's body? The egdes are really smooth and it doesnt look elevated or bumpy, so I figured you didn't use the brush that came with the Ginger Bells polish. Oh my word, this is absolutely adorable. I wish I had that much patience/skill, haha. I'm not a natural redhead, but I do have dyed red hair and a redhead's complexion. I also hate the term Ginger. It's just... bleh. Your nails are SO adorable. My little 3 year old nephew calls Gingerbread Men "Gingermans Cookies". He'd love your nails. You just do the cutest designs. I can't resist your blog! Love!!! I call a little girl at my daughter's school Ginger, she's a redhead. I didn't know her real name! So now I feel bad, and I'll ask her what her real name is so I can call her by it! LOVE the Gingerpeople nails, though! Super cute! Rita- ha ha! Red doesn't bother men, oddly enough- Maybe it's because it mostly comes from old guys that would be my grandpa's age. Oh, no! Embrace the freckles! I envy the freckles! I always wanted them! I have a few, but not many- and as a teenager, I used to sit out in the sun- not to tan, but hoping I'd get freckles! (all I did was burn...) And as for my hair, it went platinum blonde (as a tot) first, and then it went to mousey brown (teen). In the ensuing years, with the glorious assistance of chemistry, it has officially been every color of the rainbow at least once, most two or three times. Red has been my most popular color though, as I'm always trying to get back that original color. Now it's usually several colors at once. Right this minute, it is black, blonde, burgundy, purple and lavender. I know that sounds like an unsightly mess, but it's actually quite pretty. As if I were a "nature girl" except from Jupiter instead of Earth. ughh i hate the ginger term. My best friend Justin is constintally calling me a ginger just becuase he knows it bugs me. love the nails! Looks amazing, the colors the shapes all is perfect, how much did you paid for this work? and long it takes?